Hillcrest Grays are Champions of WNBL 2018! Hillcrest Grays win the Regular season undefeated as they finished with a 9-0 record. In the last game they edged Matrix 64-54. Hatchers Valkyries meanwhile ended up on the second spot with an 8-1 record as both teams directly advanced to the semifinals. Hatchers demolished Rever 95-23 in their last game. In the quarterfinals Matrix will take on Red Baron, while Segamat will face Supersports. Hillcrest Grays remain the only undefeated team at the Malaysia Basketball League. They improved to a 5-0 record beating Supersports 57-46. The latter dropped at 5-3 record. Hatchers and MS Matrix are with 5-1 records sharing the second place. 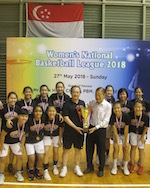 The latter overcame Penang 76-55 for the 5th victory. Hatchers meanwhile edged MGS 78-41.